If you are out on the town late on Saturday night, hopefully still celebrating the All Whites trashing Paraguay, you may want to head out onto the street to look at the moon. That’s because a partial lunar eclipse will be visible across New Zealand, the South Pacific and part of eastern Australia. A lunar eclipse, according to Wikipedia, happens when “the moon passes behind the earth such that the earth blocks the sun’s rays from striking the moon”. On Saturday June 26 New Zealand, the South Pacific and the eastern two-thirds of Australia see all of a partial lunar eclipse. The moon begins to enter the penumbra, the fuzzy edge of Earth’s shadow, around 8:56 pm but little change will be seen in the moon’s appearance for an hour. Gradually it will become obvious that the lower edge of the moon is darker than the upper. The darkening will be plain around 10:17 when the moon begins to enter the umbra, the dark central shadow. The fuzzy bight out of the moon’s lower edge will grow till 11:39 when it will cover more than half the moon’s width. After that it diminishes until the moon leaves the umbra at 1:00 a.m. The shading across the moon will persist for a while as the moon moves out of the penumbra. It leaves the penumbra completely at 2:21 a.m.
Umbral eclipse ends 1:00 a.m. Most of the North Island will see the moon rise almost fully eclipsed. Only a small part of the upper edge will out of the umbra. By moon-rise in the South Island the moon will be completely eclipsed in the umbra. This is bound to attract a lot of attention. Maximum eclipse is at 9:17 p.m. NZDT (8:17 UT). The moon begins to leave the umbra at 9:54 and is fully clear by 11:02. It leaves the penumbra at 0:06 a.m.
Our luck with lunar eclipses continues into 2011. On the morning of June 16 the moon will set fully eclipsed, as seen from New Zealand. 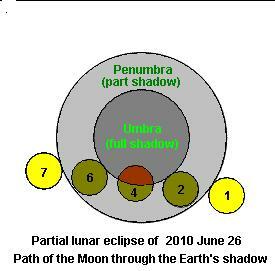 That eclipse begins the penumbral phase at 5:23 a.m. At 6:23 it touches the umbra and is fully immersed by 7:22 when it is setting in northeast NZ. Southerners will see the setting moon at mid eclipse. The moon is likely to be quite dark in colour as it will then be close to the centre of the umbra. I assume everyone has the dates for NZ v. Paraguay clear: it’s on Friday morning. (Just worried the wording might mislead a few people!) According to the paper’s TV guide live coverage starts at 2am Friday morning, i.e. after midnight tomorrow (Thursday). Hi Grant, I’m sure if we win Friday morning, there’ll still be people partying well into Sunday morning!